Last week, just before I hopped a plane for Portland, I made applesauce. I had gone apple picking with a friend over the weekend and needed to do something with all the apples that I couldn’t jam into the crisper. I quartered and cored enough apples to entirely fill my 9 quart Dutch oven, added a splash of water to prevent them from sticking and cooked over low heat for an hour or so, until the chunks of fruit lost their shape and slid away from their skins. I ran the cooked apples through a food mill fitted with the coarsest screen to remove the peels and spiked the finished sauce with cinnamon and freshly grated nutmeg. That batch made enough to fill a canner load of seven pint jars, plus a little bit more. Once the jars were on the counter cooling (they spent 20 minutes in the boiling water bath and did siphon more than a little – it happens to the best of us) I was able go on my trip, unencumbered by thoughts of wilting fruit. I got back late Wednesday night to an apartment that my husband thoughtfully and vigorously cleaned. You see, before I had left, I had woken up one morning, feeling mad at him. Once I cleared the cobwebs, I realized the anger was the result of a dream, in which he had trashed our home and I had to come home to a mess. I shared the dream with him when the feelings of it were still fresh and I think it made an impression. Thursday morning, more than a little jet lagged, I stumbled to the kitchen to find coffee and breakfast. There was fresh milk, old fashioned oats in the jar on the counter and the rest of the applesauce that hadn’t fit into the canner load I’d done the week previous. In my smallest saucepan, I combined half a cup of oats with one cup of cold water and a pinch of salt. Covered and set to low, I let the oats slowly warm. This makes them wonderfully creamy (if you start with hot water and cook the oats too quickly, they never break down nicely). After six or seven minutes at the barest simmer, I raised the heat and brought the oats to a bubble. Once they were nearly done, I stirred in a splash of milk and half a cup of the applesauce. Adding applesauce to oatmeal does two things really well. It contributes flavor (in this case mild sweetness and a hint of cinnamon) and it bulks them up without making them an overly indulgent meal. I often do the same thing with fruit butters, though since they can be more intensely flavored, I reduce the volume to a third of a cup or so. I topped my bowl with toasted almonds for protein and some dried blueberries for more sweetness. I predict many more morning bowls of applesauce oatmeal in my future this fall. yum! i add jam to my oatmeal all of the time and this is just my style. Yum! On a recent backpack trip, in lieu of applesauce I threw in apple slices I had dried for the trip. Since we were camped at 7,000 ft elevation, rehydrating them didn’t work very well. But even chewy, the apples were yummy. 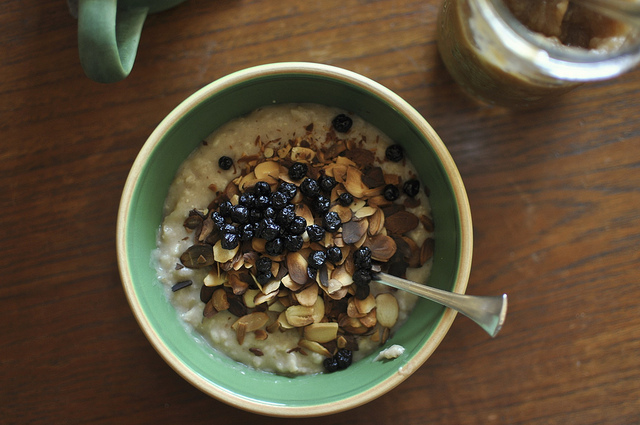 Dried blueberries are a recent discovery of mine – they are so perfect in morning oatmeal! Yum! I need to use up a big bucket of apples still… I recently made apple pear butter and used some of it in oatmeal raisin cookies to cut down on the fat, and had some this morning on toast with almond butter. Autumnal here we come! What a GREAT idea. The notion of applesauce and oatmeal just never occurred to me. Blueberries, yes but not applesauce. You sure are a whiz at whipping things together. Chances are, I would have come home to a bunch of rotten apples! Sounds yummy. But you should try with steel-cut oats. I throw them in boiling water in the evening with a little salt and let them sit, covered until the morning. A quick reheat in the pan, or a zap in the microwave and they are chewily ready for action. I tend to eat with sliced banana or raisins, but will have to try applesauce instead. This morning it was cold enough for me to bust out the gluten free oatmeal. I mixed it with applesauce (not homemade, though), butter, and walnuts — and a dash of garam masala and ginger. It was heavenly — it warmed me right up and I was ready to go and take on my day. The combination of apple sauce and oatmeal happened by accident — I used apple sauce to make granola yesterday — but thought it was funny that we both did the same thing. It’s a lovely dish. That sounds wonderful. I think it’s time to make some oatmeal! What a simple, great idea — I can’t wait to try it for breakfast tomorrow. Wonderful idea! I canned lots of applesauce this year, and this will be a great way to use it when the weather gets cold. It must be that time of year. 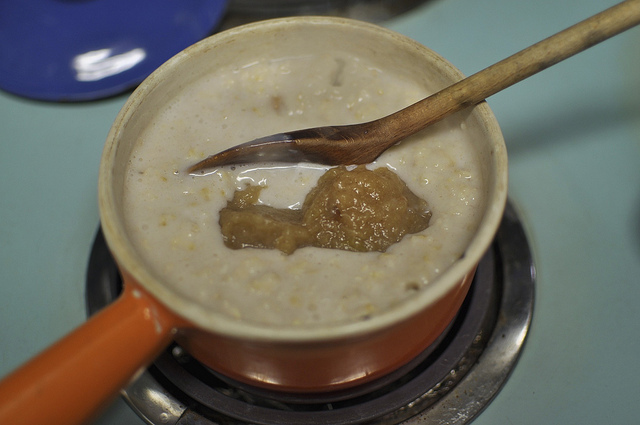 I made a pot of steel cut oats this morning, chopped up an apple and a few walnuts, stirred them into the oats for the last 3 minutes of cooking and sweetened it with a dab of homemade apple butter….Tasted too good to be healthy! I didn’t know that about the cold water! But yeah, it makes sense. I’m running downstairs right now and making that oatmeal! Thanks. I am on a diet to lower my cholesterol at the moment and applesauce (homemade!) is the perfect way thing to add to recipes! I used splenda in my applesauce, so it is sweet and silky without running up my sugar and blood pressure 🙂 Thanks for the recipe! Okay, here’s my question: HOW do you start with 9 quarts of apples and end up with 7+ quarts of applesauce? Mine always cook down at least somewhat–my best-case version started with a packed-full 6 quart crockpot that gave me about 3.5 quarts finished sauce. How do you do this? I don’t have enough actual cooking pots to create a full 7 quart canning batch of ANYTHING? Jenn, I started with nine quarts of apples and ended up with seven PINTS of applesauce, which is almost exactly the same yield that you got (seven pints = 3.5 quarts).